UPDATE: Dusty had several procedures and is thriving. She has gained weight and is enjoying being able to play and be pain free. As most of my family and friends are aware, I’ve been going through some trying times related to my pets since August 2016. (Actually since 2014 starting with Dallas’ blood disorder (IMHA) which required blood transfusion and continued medication therapy) In August 2016 our cat Chico was in the ER vet for over a week before he had to have surgery for a urinary blockage and we got him home and he was on the road to recovery. Two days after getting Chico home, we lost our beloved alaskan malamute Lacie suddenly from bloat and 3 days after that we lost our cat Chico from sudden liver failure. As you can imagine, the er vet bills are tremendous and we are still trying to pay them. In October 2016 I assisted with rescuing 4 orphaned kittens. I spent many hours hand feeding all 4. They are cute as buttons! The runt of the litter, Dusty, has stolen my heart. I am so in love with her. Unfortunately, she has issue where she can’t pass her stool like normal kittens. She is on a stool softener to help assist her. The vet feels she has a stricture in her colon blocking her from passing stool. It would require surgical procedure. I was trying to get money together to consult a surgeon/internist to see what can be done. I was also praying for a little more time to give her a chance to get a little bigger. 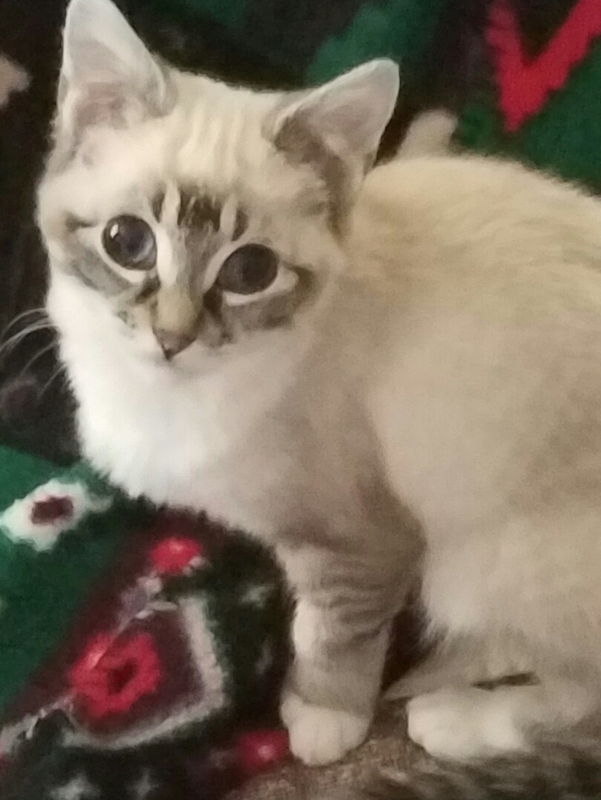 She is about 5 1/2 months old and only weighs about 2.3 lbs. 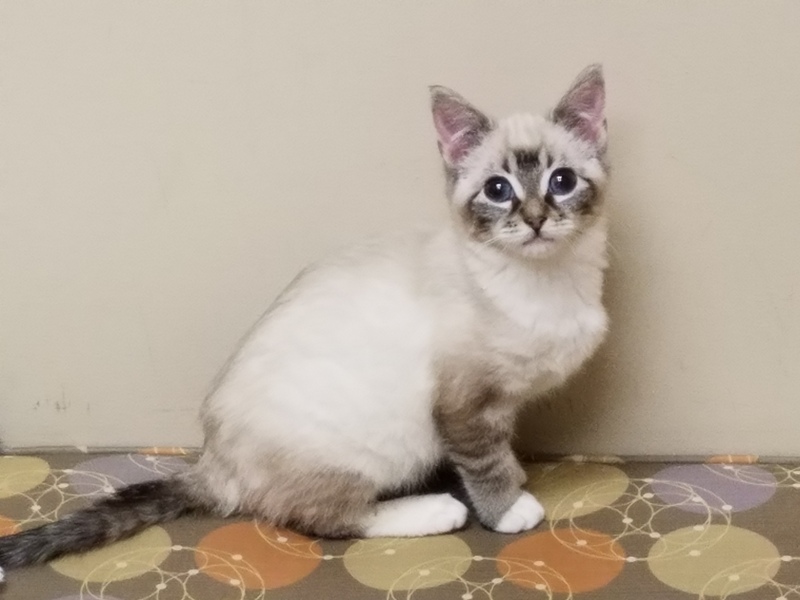 (Her 3 litter mates are almost 5 lbs) Yes, she is little but she is so sweet and adorable! Fast forward to February 2017. We lost our 15 yr old dog Catori. She was fine in the morning and we found her dead in her kennel when we got home from work that day. A couple days later our house got hit with a feline virus that sickened 6 of my 8 adult cats. (Including Dallas with the blood disorder) I am hammered with vet bills and medications. Then, to add insult to injury, our other cat, Chaz, is just diagnosed with asthma. FYI, all my cats were rescued from outside and I hand raised each of them. I love them all. On 3/1/17 we had an appointment to consult with an internist to get an opinion on Dusty. I was floored. I had no idea treatment was going to be so expensive. She needs balloon therapy to try to open up the stricture in her colon. It’s a procedure that needs to be done in a series of 5 to 6 treatments over a course of a few days apart. It will cost MINIMUM of $7500. That doesn’t include any overnight stay or complications. I am so devastated. I don’t have the money to do the treatment. I am aware there are no quarantees that the treatment will work. There’s a chance we could lose her to the procedure (we will definitely lose her without the treatment and she will be suffering from not being able to pass enough stool) Also, the treatment will most likely leave her incontinent meaning she’ll have no control of when she passes stool. I can live with the time and aftercare she will require as long as it means she is going to live. I am asking for help. I am asking for anyone who loves animals the way I do to please find it in your heart to donate to the cause. Even if it is a couple of bucks, if enough people can donate and we can raise the money, Dusty can undergo treatment. Anything would be appreciated. If we are blessed and lucky enough to raise the amount we need for her treatment, we will pay it forward by donating as much aa we can to Companion Bridge for them to continue the awesome help they give to parents of fur babies in need. Thank you everyone for listening. Please share this with anyone you can to get the word out. The vet said we should consider the treatment within the next couple months. It’s not going to get better, it could get worse if stricture closes more. Thank you again. Keep Dusty in your prayers. We’re praying for a miracle. I know some people may think it’s a waste of money but there are many out there who understand these are our kids and we would do anything to try to save them.